When reading the Jackson’s (Hebden Bridge) catalogue and the Stoddarts (Halifax )I got a sense of deja view. These two rug suppliers sold thrums and patterns suited to working with thrums. Many of the patterns in their catalogues were the same. 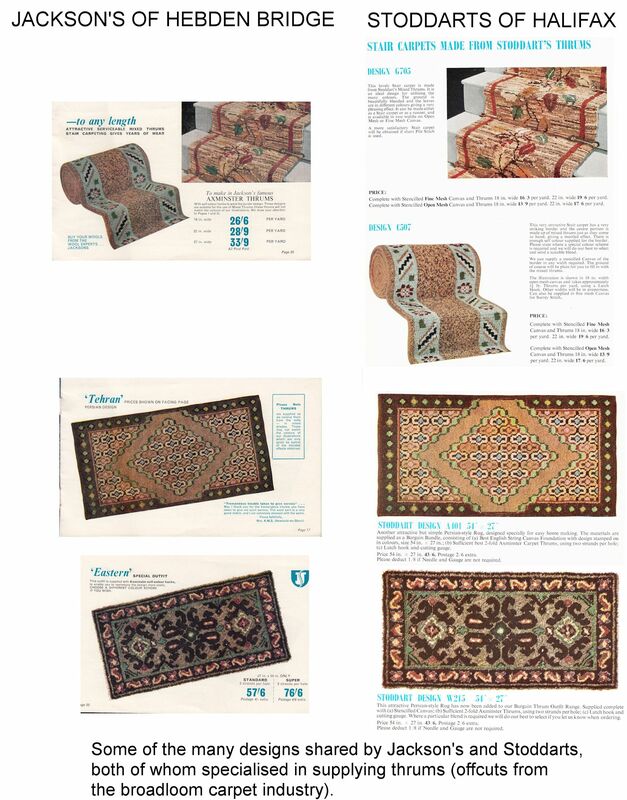 Sometimes they even used exactly the same photo to illustrate the finished rug. 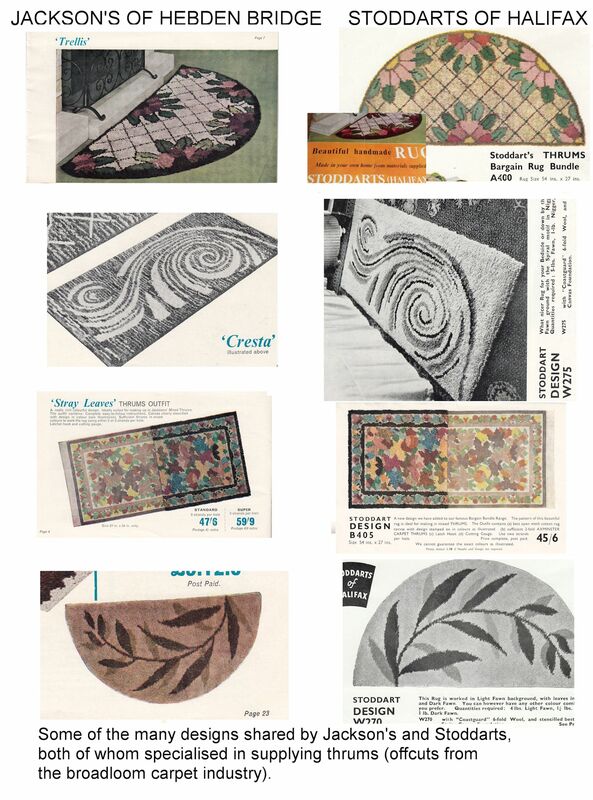 Perhaps the patterns and photos were produced by the carpet manufacturer to accompany their yarn offcuts. "Thrums" were short pieces of waste thread or yarn, for example the tail-ends of the warp thread (around 9 inches long) left behind when a finished carpet was cut from the loom. In the past, workers in weaving mills were allowed to collect these useless waste pieces of and take them home to make hooked rugs on burlap or hessian backing. The carpet industry saw that thrums could be sold commercially so the waste pieces were collected together and sold by weight, making it an economical way of buying rug wool. The thrums sold by these two companies came from the Axminster carpet industry. You could either make a random coloured rug or buy a printed canvas. With the pre-printed canvas you didn't match the yarn colours to the canvas colours, but instead worked the pattern according to how much you had of each colour yarn. The first task, therefore, was to sort the thrums by colour e.g. blue shades, red shades etc. These then had to be cut to the desired length using a wooden gauge. The thrums were used 2 or more to a hole, most often blending colours to make the best use of the threads.